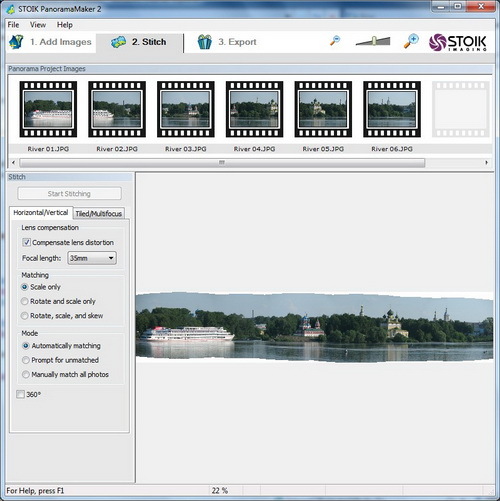 STOIK PanoramaMaker is automatic photo panorama software that turns any group of overlapping photos into high quality panoramic image. The program combines very simple user interface, step by step workflow and powerful modern mathematical approach to image matching.Program offers choice between two panorama stitching algorithms for creating Vertical\Horizontal or Tiled\Multifocus panoramas. The program analyzes the selected group of photos, puts them in the correct order and calculates panorama in low resolution. At Export stage the program renders high-resolution panorama image with manual or automatic cropping.In complex cases you can switch to manual matching mode: you can order pictures and align them by placing special markers on the distinctive features in the two overlapping photos. The program prompts to switch to manual mode if it fails to match some photo pairs automatically.In the tiled, multifocus mode the program can assemble panoramas from several rows of photos. The advanced matching algorithm will automatically compensate the focal length (zoom level) and exposure difference between source photos.The particular strength of STOIK PanoramaMaker is error-free handling of complex situations, such as presence of the moving\changing objects in the source photos with the use of STOIK's proprietary object-preserving blending algorithm. - STOIK Imagic integration;- Full Microsoft Windows 7 support;- New licensing engine;- Minor bug fixes and user interface improvements.